Thank you to Meridian Pacific for the use of the map. Party affiliation is meaningless in this race because they are both Republicans but it will be interesting to see which candidate targets the 31.6% of registered Democrats first. 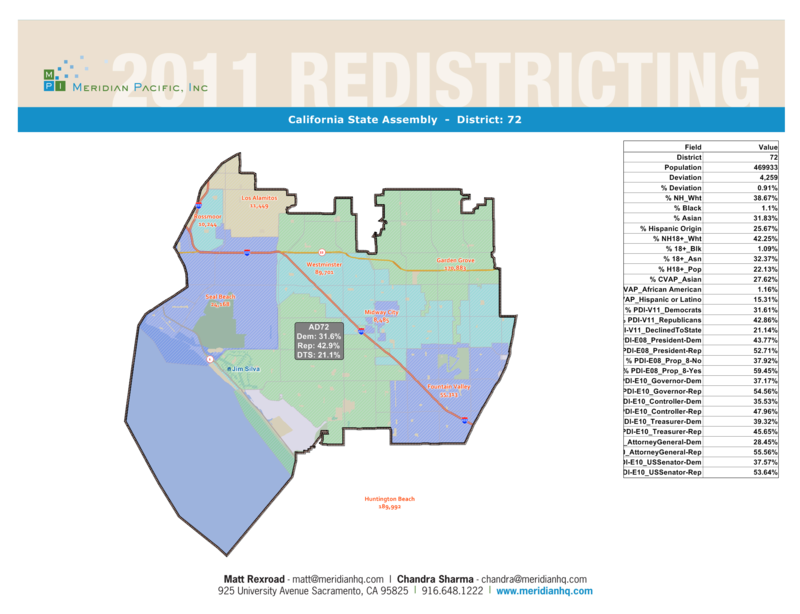 It is also interesting to note that Huntington Beach is the largest part of the district which is where Allen is from. Los Alamitos is the smallest city on the district which is where Edgar is from. It is pretty amazing to see who close Allen, Dovinh, and Pham were to that 2nd place slot. Looking it the results it appears that Edgar has an advantage going into november which would mean that Travis Allen needs to raise his favorability amongst voters before voting in November. This entry was posted on September 19, 2012 at 9:59 AM	and is filed under 72nd Assembly District. Tagged: Albert Ayala, Joe Dovinh, Long Pham, Travis Allen, Troy Edgar. You can follow any responses to this entry through the RSS 2.0 feed. You can leave a response, or trackback from your own site. That leaves about 50% of the votes in the precinct available. Long Pham has not selected his choice for endorsement, but one of the Vietnamese communities leading Republicans (Van Tran) has come out to endorse Allen and is participatory in his campaign and that goes a long way in the Vietnamese press. Ayala voters were low information (D)’s [they really had to be to vote for Ayala] that voted for the first (D) name they saw on the ballot. With two (R)’s they may just not select one. That means that Edgar has to make inroads into the Dovinh (D)’s. Now in a portion of the AD there is a reason for the (D)’s to come out [Lowenthal] and that bodes not so good for Edgar as that area knows him for the Trash Agreement mess that he got the City of Los Alamitos into. Add in that the most major voice against him in his own town is a guy that once ran for Congress as a (D) and getting those (D)’s looks less and less likely. Now, if Dovinh or Nguyen were to in any way show that they support Allen over Edgar (in the choice of two candidates, neither which you can endorse, which is the lesser of the two evils kind of thing) that would cut even more from his chance to turn those (D) votes to his column. That would give Allen 32724 votes and Edgar 23028. In order for Edgar to win he would have to move about 4,500 of those votes away from Allen to him. Allen picked up a great deal of steam with the Tax’n Troy line during the Primary. If he goes after some of the recent revelations of the hidden taxes that were in the Los Alamitos trash agreement that might just resonate a bit too much for Edgar to get past even with his current cash advantage. I’ll agree that this is a hard one to call, if only because the system has put two (R)’s on the ballot and the (D)’s already feel disenfranchised by that. I’ll also state that when a candidate has such a clear cash on hand advantage the desire is to move in their direction when making the call. But that cash on hand advantage is mostly Edgar’s own money. In other words, it’s fools gold. We have seen many politicians flush with their own cash NOT be able to buy public office, and that may be the case here. There are still too many variables (Pham endorsement, Nguyen endorsement, Dovinh speaking out, etc.) in play to get a good read, but Edgar’s ability to self finance his campaign isn’t a slam dunk to the championship Assembly. “I have the unique perspective of having been a candidate in this election. I had the opportunity to get know both candidates and I can tell you without reservation, Travis Allen is the only candidate we can trust to represent our community in Sacramento,” commented Dr. Long Pham.